Different containers Glass for liquids, in ancient Egypt, as early as 1500 bc. Produced in Chr. But only through the invention of the glassmaker pipe (and thus glass blowing) in the 2nd century BC. By the Phoenicians in the area of Syria From the beginning of our era, the Romans were also able to produce glass bottles to a greater extent. The oldest wine bottle the world is exhibited in a museum in Speyer. It was found in a Roman tomb and dates from the 4th century AD. Due to the fragility of the glass, mainly vessels made of clay or earthenware and wooden barrels continued to be used for transport and storage until the 17th century. Wine was also not then in small containers but almost exclusively in large containers (mainly wooden barrels ). Half of the world was then England controlled. Many Englishmen had possessions in Portugal (where they the Port wine industry justified), in Spain (where the same for the sherry applies), in Sicily (where also by an Englishman the Marsala was invented) as well as in the Bordeaux with in each case lively wine trade with the motherland. Overseas this was in the Caribbean, in this case with spirits as gin or rum, Therefore, it is no coincidence that the bottle was invented or perfected for wine and spirits in England. The English diplomat Sir Kenelm Digby (1603-1665) developed in 1652 an improved technique for the production, but did not care about a patent. The glory earned then John Colnett, who filed a patent in 1661. Initially they had a spherical body with a long neck and slowly developed until the beginning of the 18th century onion-shaped, short-necked vessels called "mallet" (Schlegel) or "horse's foot". The olive-green bottles shown in the picture (17 cm height, 14 cm diameter) were manufactured about 1710 to 1750 in northern Germany for the Dutch market from forest glass (Pottascheglas). At that time was also the use of cork already widely used as a closure. The bottles were provided with a bead at the top of the neck, which served as a safety catch for the cords attached with cords. On the bottle body was also often a glass seal melted, on which too nominal volume but no synopsis was included. This offered some protection against fraud by too small bottles. After the advent of glass bottles in the mid-17th century, it was forbidden for a long time to sell wine by the bottle. Because of the different sizes of the bottles, scams would have opened the door. Until the beginning of the 19th century, instead of the bulbous spherical shape then prevailed today, the usual roll shape, because this far better suited for stacking the bottles. The first producer to produce bottles in this form was Ricketts in the English city of Bristol, where the company had a patent for it. At this time came the first labels in its present form in use. Despite the industrial production of glass bottles, the marketing in bottles until well into the 20th century was rather the exception and was mainly only for better qualities. For the most part, in addition to the above reason, wine was also marketed from a practical point of view for easier transport in barrels. In many countries, the general sat bottling only after the second world war through. 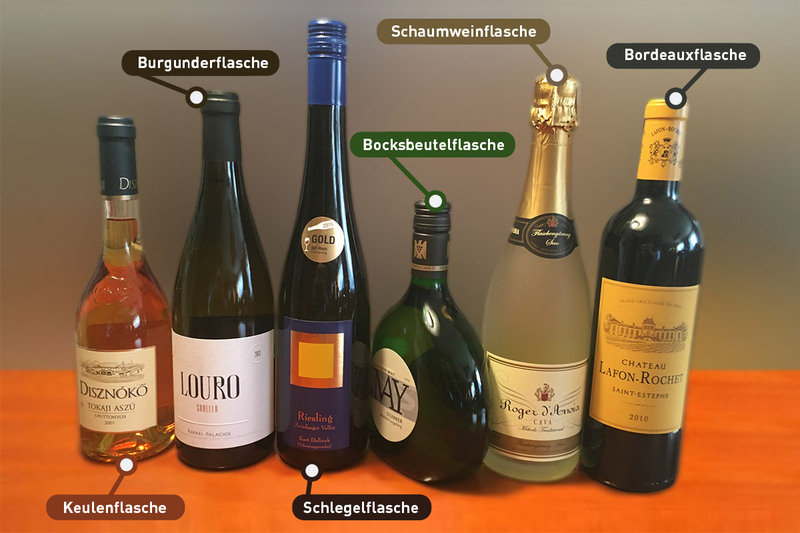 Many countries, vineyards and even producers have created specific bottle shapes, sizes and colors to create a unique identity for marketing purposes. In the German growing area Saxony is the cone-shaped Saxony club, in the growing area Rheingau the slim, brown Schlegel bottle and in the growing area Moselle the same in green color. The flail bottle (also called "high bottle") is most commonly used for white wines in Austria, Germany, Switzerland and the French Alsace region. From France, the names of shapes and colors named after the regions originate Bordeaux. Burgundy- and champagne bottles, which are now used worldwide. Especially the Burgundy bottle became popular worldwide in a short time due to the Chardonnay boom in the 1980s. In addition, there are specialty bottles in many countries such as the Clavelin for the Vin Jaune wire braided Alambrado for the Rioja, the bocksbeutel in francs (also in Greece and for the Armagnac in use), the Albeisa in Piedmont for the Barolo and Barbaresco or earlier the unspeakable bastumflochtene Fiasco for the Chianti, In addition, there are individually designed bottles for producers. For a long time, the standard size of wine bottles was usually 0.7 liter. After an unsure thesis, she goes to the famous monk Dom Pérignon (1638-1715), who had determined this as the average intake of male adults at dinner. Others are purely practical, because that's about the same amount of air that a glassblower can take in the lungs at once. But they were big too wine vessels up to 30 bottles of content in use. These bulbous Vessels were used primarily for storage. The first legally established bottle size within a country was the "Pinte de Paris" introduced in 1735 under the French King Louis XV. (1710-1774). This Volume, for wine, beer and cider bottles was 0.93 liters and had a minimum weight of 25 ounces (765 g). The wine bottles in Europe had a volume of around 0.7 liters with a range between 0.65 to 0.85, which lasted until the 1970s. Only then did the current standard of 0.75 or three quarters of a liter for wines prevail worldwide. Since 1977, 0.75 l has been the European standard for wine bottles; but 0.7 l was still used in Germany until 1987. This size is referred to in gastronomy as 1/1 (Eintel). In Switzerland (Vaud), the 0.7-liter bottle is still in use today and in the US, the 0.75 liter size is still not used consistently. at spirits However, the volume is still mostly 0.7 liters. But there are also numerous smaller volumes and oversizes, which are listed below (see also under nominal volume ). Especially in Bordeaux. Burgundy and Champagne It has long been common to fill wine or sparkling wine in larger bottles. The bottle aging in larger bottles is slower, which can have a positive effect. Wine is the most common Magnum with one and a half and the Doppelmagnum with three liters volume. The overlying sizes are usually only showpieces for marketing activities. To protect the wine from the harmful effects of UV light To protect most wine bottles are produced with dark colored glass. Many bottles are for practical reasons bottle bottom a dent. Most bottle oversizes are named after famous biblical figures. But there are different versions, for what reason and when they were first used. The well-known wine author André Simon (1877-1970) said that the names were chosen in accordance with the greatness and honor of the mighty kings of Israel (but not all kings are). The first use of biblical names dates from 1725, as a winemaker in Bordeaux Jeroboam used for the sixfold bottle. The alleged reason was that this was called a "man of great value". Perhaps they were inspired by Eugene Destuche, a poet from Champagne who mentions Jeroboam and others of later names in his works. The tradition of using biblical names for over-formats, however, was not continued until the 1940s, especially in France. Some have different volumes in Champagne (for champagne) and Bordeaux (for still wines). From the volume of six liters, they are usually only for champagne used in small quantities or for marketing purposes. Some bottle oversizes are only for storage or maturation such as the demijohn (Lady Jane) with a volume of 45 liters and the contents are then transferred to normal bottles before being marketed. at ship christenings are preferred the three champagne or sparkling oversizes Magnum (1.5 l), Jeroboam (3 l) or Rehoboam (4.5 l) used. The three largest wine bottles in the world are special one-offs. The third largest bottle belongs to the Australian wine merchant Kim Bullock and served in 2007 for the promotion of Australian products. She is 196 centimeters high and weighs 485 kilograms. The bottle, which is made in Germany and filled in Australia, contains 387 standard 0.75 liter bottles, which gives a volume of more than 290 liters (equivalent to 1.3 Barrique barrels). The bottle contains a Shiraz cuvée ( Syrah ) of the 2005 vintage of five Australian wineries. It is closed with a Portuguese special cork. The second largest wine bottle was filled in 2007 in Burgenland (Austria). It was manufactured by Lenz Laborglas in Wertheim am Main (Germany), is 2.40 m high, weighs 630 kg, has a diameter of 68 cm, a wall thickness of 1 cm and holds 480 liters. She was with one Trockenbeerenauslese of the winery Kracher Weinlaubenhof in the municipality Illmitz (Weinbaugebiet Lake Neusiedl ) filled. The record bottle was commissioned by Swiss entrepreneur Migg Eberle, owner of a restaurant and collector of large bottles. The "TBA Grande Cuvee Vintage 2005 Number 7" was closed with a 1 kg heavy 18 cm diameter cork made in France. The cost was around 75,000 euros, the content is worth about 50,000 euros. The well-known in Austria "wine pastor" Hans Denk (1942-2019) gave the bottle his blessing on the way to Switzerland. There it will be exhibited in the "Gasthaus zum Gupf AG" in the town of Rehetobel near Rorschach (Appenzell). The bottle should never be opened, but only serve as a showpiece. By far the largest wine bottle in the world comes from the municipality of Watt in the Swiss canton Zurich, It is 3.80 meters high, has a diameter of about one meter and weighs together with the wooden frame over three tons. The volume is 2,011 liters with a cuvée from the varieties Pinot Noir ( Pinot Noir ) and Dornfelder from Watter Lagen, which corresponds to 2,681 bottles of 0.75 liters. The cork is "pillow-sized". The bottle was made in Thurgau, the wooden frame was built by a carpenter from Watt. The giant bottle is in the Guinness Book of Records, The content was served in autumn 2011 to the visitors of the annual village festival. This page was last modified at 24 April 2019 at 07:36.